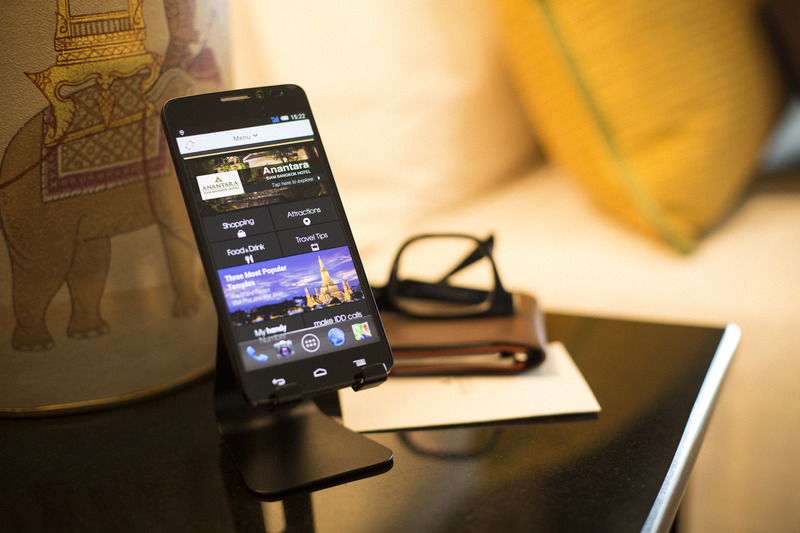 ANANTARA SIAM BANGKOK HOTEL and Anantara Riverside Bangkok Resort now offer a complimentary smartphone called “handy” in all guest rooms – the first hotels in Thailand to offer such a service. Much more than just a smartphone, the aptly named handy device is preloaded with destination specific features to offer a superior guest experience and interactive travel solutions for leisure and business travelers. The smartphone keeps guests connected, informed and entertained 24 hours a day, both onsite at the hotels and when they are on the move. handy also offers unlimited local and international calls to ten destinations from each hotel, including Singapore, Hong Kong, Japan, China, the United Kingdom and the United States. Unlimited 3G data connectivity comes with a WiFi tethering capability to other mobile devices such as laptops and tablets and also pre-installed popular social media apps like Facebook, Twitter and Instagram. These features eliminate the expense of data roaming and high phone bills, and make it exceptionally easy to stay connected with friends, family or work. Whether guests are in Bangkok for business or pleasure, getting out and about for sightseeing, shopping, events or meetings are seamless with a selection of pre-installed travel apps, including currency conversion, maps, GPS, news and translation services, enhanced by the option of installing additional apps from the Google Play Store. A digital city guide includes recommendations and promotions for restaurants, shops and tourist attractions. Returning to the hotels after exploring the city is made easy using the handy taxi card feature, which details the hotels’ addresses written in Thai with a location map included for easy reference. handy is also a great travel companion, with direct dial features that can be used whilst on the move around the city, as well as at the hotels. Browsing history and any additional apps that have been installed and all personal information will be removed at check out.